We propose that end-use energy demand research can re-interpret the health sciences research structure in order to found a robust research and analysis framework from which to address the pressing issues surrounding end-use energy demand. Energy Epidemiology addresses the need for robust empirical evidence whilst providing an environment that allows for interdisciplinary research for addressing the complex relationship between people, systems, environment, and energy demand. What does this look like? We see the structure being interdependent, with findings from the various models being shared and built upon. Although the population-level ‘epidemiological model’ encompasses the other three models, this should not imply a hierarchy. Rather, it means to emphasize how an epidemiological approach uses theory, insights, understanding, aetiology and findings to drive forward the detection of patterns related to energy demand at the population level. We see the structure of end-use energy demand includes at least three parts: end-use energy processes and systems (i.e. engineering and physical sciences), end-use energy practices (i.e. socio-behavioural interactions) and end-use energy context (i.e. population level studies of energy demand in context), shown in Figure 1 and described in Table 1. The interactions of users with physical systems for a service, within a context. Energy epidemiology provides an over-arching approach for all the disciplines that impinge on energy demand are involved. Where findings from large-scale studies both inform energy policy development and evaluation while providing a context for conventional small-scale studies and insights for predictive models (Figure 2). Thus if a study identified that a particular construction practice is an issue for increased energy demand, its prevalence and impact may be estimated more rigorously in the stock, with the findings available to refine further research on the topic in large-scale studies. 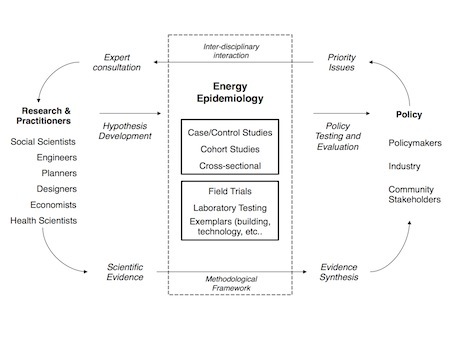 Energy epidemiology therefore provides a connecting structure that drives improvements in the empirical evidence base through the iterative cycle from policy development, small-scale research and investigation, and population or community level findings. The primary aim of Energy Epidemiology is to investigate causes and effects associated with the use of energy within defined sample. By relying on related sciences (such as sociology, physics, engineering, etc.) to describe mechanisms of an energy demand outcomes. 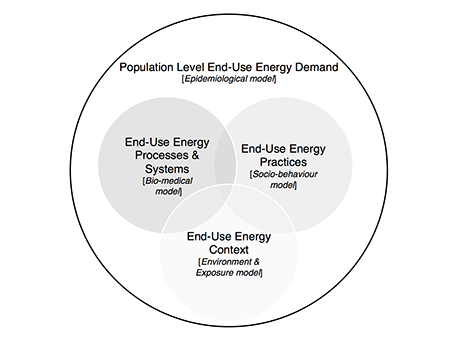 Energy epidemiology considers the complex interactions between the physical and built environment, socio-economic features, and individual interactions and behaviours on energy demand. Energy epidemiology provides an approach that draws together existing expertise and salient research practices in an inter-disciplinary collaboration, to close the gap between theory and practice and to support purposeful intervention in the whole energy system. The RCUK CEE sees that the pre-requisites for the success of an epidemiological approach to energy research includes funding, developing and training of the next generation of energy scientists, the deliberate creation of environments capable of supporting an interdisciplinary research culture, a concerted effort to improving data collection and access, along with collaborative activities to share methods and insights. We believe that a self-supporting, critical and creative system of science will emerge from the interdisciplinary approach offered in Energy Epidemiology and we will provide a platform on which to build and apply this approach.